White Chocolate Wonderful takes a walk on the savory side in this peanut butter pumpkin soup recipe. Caroline Wright shows Alejandra Ramos how she first caramelizes a mixture of peanut butter, onion, garlic, and spices before adding canned pumpkin puree, freshly cubed pumpkin, and chickpeas to complete the soup. Garnished with mint, pomegranate.and a drizzle of olive oil, this fall recipe boasts some bold flavors. While you’re shopping for your porch pumpkins pick up an extra to make this hearty and comforting soup. 1. Heat oil in a large pot over medium. Add onion and garlic and cook, stirring occasionally, until onion is tender, 6 to 8 minutes. Stir in cumin and coriander. 2. Raise heat to high and stir in peanut butter. Cook, stirring constantly, until peanut butter darkens to a deep golden brown color, 3 to 5 minutes. Stir in canned pumpkin, then chicken broth. 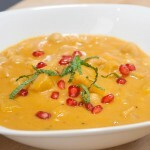 Add pumpkin and chickpeas and simmer until pumpkin is tender, 10 to 12 minutes. Season with lemon juice, salt and pepper to taste. 3. Serve in bowls topped with mint, pomegranate and a drizzle of olive oil. 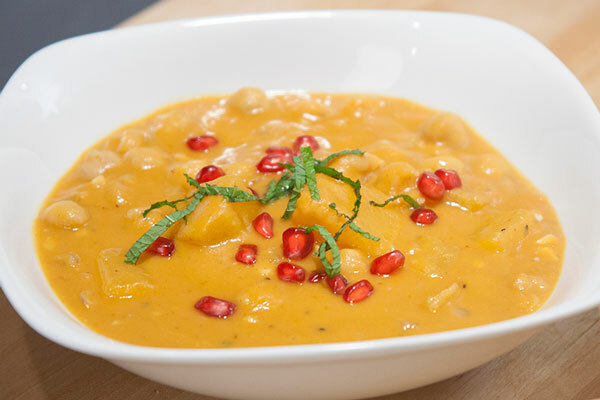 The post VIDEO RECIPE: Peanut Butter, Chickpea and Pumpkin Soup with Mint and Pomegranate appeared first on - Peanut Butter & Co. Recipe Blog.